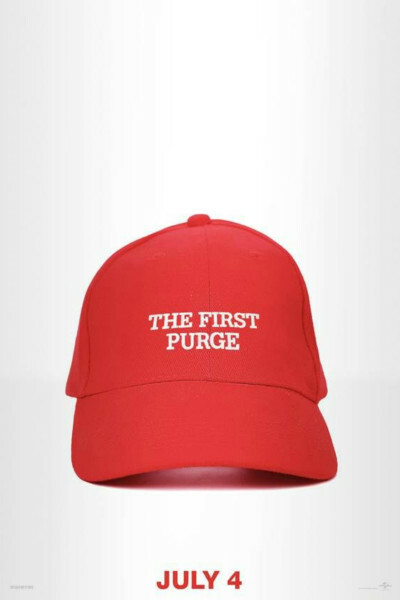 The First Purge, aka The Purge 4, is (as its poster makes demonstrably clear) no small jab at what have increasingly become fringe elements of the Trump Party and its sundry, extremist coterie, be they white nationalists or supremacists or alt-righters, possibly the NRA, and/or anyone who harbors "homeland" world views and is looking for an excuse to make manifest his/her destiny. This, the fourth installment in the Purge series, is no more or less creative than its predecessors, which is to say it's nothing if not reliably predictable. The premise continues to work, albeit a disturbing one (when not too heavy-handed, cheesy, or riotously laugh-out-loud funny). Here, we are taken back to the very beginning of the Purge origin story in which "behavioral scientist" Dr. Updale (played embarrassingly by Marisa "My biological clock is tick-tick-ticking" Tomei), herself an apparatus of the "NFFA" (some Aryan-like Tea Party, I gather, which—in cahoots with the NRA on steroids—has displaced both Republicans and Democrats and is led by one dominant sounding "President Bracken" at a point in time unmentioned and irrelevant). For 12 harrowing, bullet-strewn hours, Staten Island citizens who volunteer to receive a microchip implant, remain on-island for the night, wear obnoxiously luminescent [and easily-seen-by-adversaries] blue or green eye contact lenses with nano-digital cameras, and "actively participate" in the Purge receive $5,000 in cold hard cash for their warisome efforts. Think Saw meets The Running Man meets 1984's Surviving the Game meets Mississippi Burning. Ugh and Ick is right. It's very racially charged. In short, it's a window-dressed xenophobic excuse to arm housing project residents, turn them against one another, then send in armed mercenaries from the 'burbs on [ironic] Harleys and klansmen from the hills in rattly pickups to exterminate the locals. You know, human-hunting for sport, or genocide in the hood. Their words, not mine. That's how they set it up. The movie unflinchingly widens then absurdly exploits whatever societal divisions one may perceive, but never does so in a constructive way that might actually encourage moviegoers to have a conversation afterward. Gosh no, that's way too high-minded and heady for such fare. This fare is about stereotypes, hyper-violence, guns, ammo, Van Damme-like tough guys in white tees, and damsels in distress. You know, societal artifacts and anachronisms, theatrical heroism of old (the sort in which Billy Jack saves the weakling hippie kids from cowboy bullies), and scriptwriting that belongs way back in the past (if at all), social eons before the #metoo movement and the era in which we find ourselves today. I rolled my eyes, harrumphed, and grimaced at the crude generalizations more times than I care to recall, now that it's over and behind me. Setting 'premise' and politics aside for a moment, and pondering the actual cinematic quality and contribution of The First Purge, Melania's army-jacket-message probably best captures the sentiment moviegoers' seemed to have while wandering listlessly out of the movie. That's too bad, I think, because after presenting such a bleak, dystopian point of view of humanity, wouldn't it have been really nice if the film prompted important conversations rather than simply introduce the forthcoming 10-episode The Purge TV series coming this fall to the USA Network? Yes, it would be nice, but that's light-years beyond this franchise's grasp. This franchise's aim is to create a killer soundtrack (pun intended), introduce lots of guns, Tonka trucks, and toys to aggressive, disenfranchised twenty-somethings, and get seatmates to pass the popcorn. Apparently, no one's interested in much more, so let the bullets fly.